At the start of the 20th century Norway had the fourth largest merchant fleet in the world. The fleet served customers all over the world. Tenold uses three elements to explain the strong Norwegian position in global shipping in 1900: geography, history and culture. Norway has Europe’s longest coastline, and depends on the sea for transport and resources. Experience of difficult local waters was important when the oceans were liberalized after 1850. Norway’s maritime traditions, helped by a trust-based and egalitarian culture, channelled large investments into shipping through part ownerships [partsrederier]. At the start of the 20th century, the sentiment of the Nordahl Grieg poem quoted above undoubtedly rang true: Norway and its flag was everywhere. The country’s ships were anchored in or voyaging between ports all over the world, facilitating the growth of commerce and enabling the formation of a truly international economy. Through ships, sailors and shipowners, this small country on the outskirts of Europe reached very far. Norway had the world’s fourth largest merchant marine, trailing only supremely dominant Great Britain —with around half of the world’s seaborne transport capacity—Germany and The United States . Around 6.6 per cent of the sailing fleet and 3.6 per cent of the steamship fleet were flying the Norwegian flag. Shipping had continued to increase in importance after Kiær made his international comparison a decade earlier. Norway’s merchant marine amounted to 1227 tons per 1000 inhabitants—so the “average” Norwegian actually owned more than one ton of shipping tonnage. Consequently, the shipping capacity per capita was high—much higher than the UK in second place, more than three times higher than Denmark in third place and more than four times higher than fourth-placed Greece . In other words, no country had put such a large share of its investments in ships.2 No country depended as much on shipping. Table 2.1 provides an overview of the world’s merchant marine and the seaborne trade volume of the most important participants in the international economy in 1900.3 The left side of the table shows the size of the fleets; the sailing fleet, the steamship fleet and the total tonnage. The column “effective tonnage” is the best measure of the carrying capacity of the fleet; here the figures have been adjusted to account for the higher productivity of steam vessels. Britain clearly dominated the oceans, with more than half of the steamships and more than 48 per cent of the “effective” world fleet. To illustrate how the world had been divided into countries that performed shipping services for others, and countries whose trade was transported on foreign keels, we can consider a hypothetical world where shipping services were not traded internationally. If the ships only carried the countries’ own seaborne trade, each Norwegian “ship ton” would transport 2.26 tons of cargo annually, while each British “ship ton” would carry 3.56 tons of cargo.6 At the other end of the scale we find Portugal where, if the country’s trade was transported solely on Portuguese ships, each “ship ton” would have to carry more than 100 tons of commodities on an annual basis. The Portuguese example illustrates that maritime hegemony is not permanent. The Iberian country that four centuries earlier had become famous for its first-class explorers, whose exploits were based on superior technology and outstanding nautical knowledge, had become insignificant in international shipping by the start of the 20th century. Indeed, four Norwegian cities—Bergen, Kristiania, Tønsberg and Stavanger—had larger fleets than Portugal . The Bergen fleet alone was more than four times larger than the Portuguese merchant marine. The descendants of Henry the Navigator had clearly lost their course. The Norwegian ships, on the other hand, were all over the place, serving the needs of world trade. Although sailing ships had gradually been squeezed out of most short-distance trades by the more efficient steam vessels, Norwegian sailing ships remained competitive in certain market segments; copra from the Pacific, wheat from the Americas, coal from Australia and guano and nitrates from the western coast of South America. Here, voyages were long, and there was little reason to pay a premium for speedy transport of such cargoes, so the sailing ship technology was still viable. Moreover, ships make money when they are carrying cargo from A to B, not when they are lying still. In ports with inferior facilities, where loading and unloading was cumbersome and slow, it made economic sense to have an old, cheap sailing vessel lying idle for months, rather than a modern and expensive steamship . Norwegian ships had a market share of around two-thirds in the country’s own imports and exports. The most important competitors were British ships—carrying slightly more than 10 per cent of Norway’s foreign trade—followed by Danish , Swedish , German and Russian /Finnish ships.11 The home trade—slightly more than 4 million tons—only made up around one-eighth of the volumes carried by Norwegian ships.12 In other words, more than 87 per cent of “the production” took place between foreign ports.13 Figure 2.1 gives an indication of the most important markets—though again, it is important to remember that the effect of sailing distance is not taken into account. Figure 2.1 shows that around two-thirds of the cargoes that the ships carried came from or were bound for Europe.14 With more than a quarter of the entries and exits, the UK was the single biggest market for Norwegian ships, reflecting the crucial role that the British Empire played in international trade around the turn of the century. Interestingly, Norwegian ships transported more cargoes to and from “the Americas”—North, Central and South America—than to and from Scandinavia. Revenue-wise, Britain also appeared to be in the lead, with gross freight earnings of more than NOK73 million, as shown in Fig. 2.2.15 Earnings from the American market were only marginally smaller, at NOK69 million, but were in fact more important. The reason for this is the manner in which the business was conducted: many of the ships trading on the Americas operated on time charters, where the Norwegian owners did not have to pay bunkers and port costs.16 So, when it comes to the amount of money that was returned to Norwegian sailors and investors, the most important market at the start of the 20th century was the Americas, particularly the United States , which was responsible for two-thirds of the gross freight earnings from that region. The gross freight earnings do not show profits, as they usually do not take into account the costs accrued abroad when “producing” the transport service. Operating costs were typically higher for steamships than for sailing ships, due to their appetite for coal. However, there were substantial variable costs for sailing ships as well—although the wind was free, sailors had to be paid and fed, and ropes and sails had to be maintained, and were changed with surprisingly high frequency. The tonnage data in Fig. 2.2 do not include ships travelling “in ballast”—ships that were sailing from one port to another without revenue-generating cargoes. Differences between ingoing and outgoing volumes thus reveal the disequilibria in the trade of the various parts of the world. Continental Europe and Africa , in particular, had much larger volumes entering than going out, while there was an export surplus, volume-wise, from Australia and the Americas. The data above provide information about where the Norwegian ships were employed and suggest some differences between regions and vessel types. Although the Norwegian statistics inform us about the countries that were visited, they only include a single locational marker for each voyage—either country of departure or country of arrival. In order to understand both where ships came from and where they were going, as well as the importance of individual ports, we can turn to the British periodical Lloyd’s List. With London still very much the centre of world transport and commerce, Lloyd’s List provided producers, charterers , traders, brokers and others involved in the shipping industry with news and information. This snapshot of Norwegian shipping in 1900 shows a small country that is clearly “punching above its weight” in the international shipping industry. In the 1870s Norway had the third largest fleet in the world; by 1900 the country had been relegated to fourth place. But in no other country had local investors put so much of their resources into ocean-going ships. How can the strong position that shipping held in Norway, and the country’s central role in the international shipping market, be explained? At the start of the 20th century, three fundamental features combined to explain how this small country had managed to become one of the world’s leading maritime nations; geography, history and culture. The land and the sea shaped experiences, and experiences influenced values and attitude. The result was Norway, the maritime nation. The shape of the country implied that the sea was a much more important means of communication and transport than the land. The topographical conditions—the high mountains that separated the fjords and the modest settlements along the coast—forced Norwegians to take to water and undoubtedly played a decisive role in the development of maritime know-how and their orientation towards the sea. Water provided the most important means of transport and was a significant source of supplies. The geography in the coastal areas had created the archetypal Norwegian sailors—the Vikings. Their ability to build advanced ships, their navigational skills and seamanship, as well as their outward orientation—all were features that we can see traces of in Norway in the 19th and 20th centuries. We see these traces, not due to an unbroken line from Viking exploits to modern Norwegian shipping, but because the geography that promoted and honed these skills remained constant. During the 20th century, telecommunications, airplanes, cars, trucks and high-speed trains have revolutionized human interaction. However, to understand the role of the sea, it is important to remember that these are new phenomena. Well into the 20th century, water bound people together, while land separated them. Water transport was the least costly and most efficient way of carrying cargo and people, and maritime skills thus became a means for economic and cultural survival in a country such as Norway. The sea connected markets and districts, while dry land—mountains, in particular, but also forests—kept communities apart. The country’s position—in the northern part of the European continent and cut off from vibrant markets—stimulated trade in general, and medium-distance trade in particular. The central role played by the sea, both in local communications and in the harvesting of resources, gave Norwegians an advantage in seaborne transport. Subsequently, in the 19th century, when markets were opened and international trade increased, this skill became a selling point in itself. Moreover, the fact that Norway was not a major power actually helped business abroad, securing market access due to the apparent lack of colonial pretensions. There is another geographic factor worth noting: Norwegian shipping was a widely dispersed economic activity. The ownership of vessels engaged in international trade was not confined to a handful of industrious cities or trading towns, but spread all along the coast. There was the aforementioned concentration in the southern part of the country, as fishing was the favoured maritime activity further north. However, in the south, although sea transport primarily was an urban activity, numerous small communities along the coast and in the fjords invested in tonnage and supplied seafarers for the international market. Within Norway, the legacy as a maritime nation has always been very visible, even on shore; “in Western Norway [almost everybody] is a sailor. The hotel porter has an anchor tattooed on both forearms; the taxi-driver and the waiter talk the uninhibited English that is the lingua franca of the sea.”29 Statues and memorial plaques have been dedicated to courageous sailors, while streets, buildings, museums and galleries carry the names of prominent and generous shipowners. The shipping industry is more present in Norwegian society than in practically all other European nations.30 Some shipowners have established wealthy foundations that donate money to art and research, while other foundations target social issues, providing support for seamen’s widows, their surviving children or sailors “in economic difficulties.”31 Some shipowners are highly visible public figures, while others—ironically—are famous for their anonymity. Finally, a large number of people still work in the offices of shipping companies, maritime insurance and financing companies, in shipping banks, ship brokers and other related business, or are engaged in a variety of maritime activities. They are part of the maritime legacy, and continue to be an important economic reality. But even history has to start somewhere, at some time. Norway’s rise as a major maritime nation was a protracted and erratic journey, one that did not achieve sustained and rapid growth until the second half of the 19th century. After the Dutch lost their dominant position in the trade on Norway in the middle of the 17th century, a specific pattern developed with regard to the advance of Norwegian shipping. When the major European powers—the UK, France , the Netherlands , Spain —were involved in wars, the Norwegian fleet increased. During periods of peace, or—even worse—when Denmark-Norway was involved in wars with their Nordic neighbour, the market share fell. Again, Norway did well as long as the country stayed away from the conflict, but when Denmark-Norway was dragged into the war, there was little consolation in the Norwegian flag. In 1807, following the pre-emptive British bombardment of Copenhagen and the Danish-Norwegian entry into the war, more than 550 ships, as much as a third of the fleet, was lost. The effect on Norwegian shipping was devastating. In the subsequent years, British authorities continued to confiscate Norwegian ships, and by the end of the war more than 5000 Norwegian sailors had been put in prison in the UK, some for as long as seven years.40 Although Norwegian privateering partly balanced the picture, the British might at sea was too strong. In the short term, the Danish-Norwegian participation on Napoleon’s side in the conflict had dreadful effects; famine, un(der)employment, increasing mortality, economic decline, financial and monetary collapse—“one of the bleakest periods in modern history.”41 In the longer term, the fact that Denmark was on the losing side, meant Norwegian freedom. At end of the war, Norway’s status as a Danish province ended after almost three centuries.42 Despite the introduction of a Norwegian constitution, the country’s independence was very short-lived. In November 1814 the recently established parliament was forced to accept a union with Sweden. The attempt at full independence thus ended in futility and political compromise, and Norway became the “little brother” in a personal union with Sweden. In addition to the parliament and the constitution, Norway retained executive and judiciary powers, but the two countries shared the monarch—from the Swedish house of Bernadotte—and the foreign policy was conducted by the Swedish Ministry of Foreign Affairs. This expansion of Norwegian shipping in the first half of the 19th century was not based on long-distance trades, but that soon changed. In a Parliamentary discussion on maritime skills in 1839 it was emphasized that “it is not common – but rather an exception – that our captains sail the distant seas.” Consequently, the politicians saw the need for formal nautical education as limited. The reason was that the ships primarily operated in the North Sea—“at most extending to the Baltic”—where “experience to some extent can neutralize the lack of navigational knowledge.”45 In the second half of the 19th century, this local, northern European focus became relatively less important. Again, the basis was primarily political, and again, the political decisions were not made within Norway. The aggressive acquisition of market shares in Sweden in the 1830s and 1840s was a prelude to what happened in the second half of the 19th century—though by then the backdrop was not just advances at the expense of a neighbour, but the lifting of restrictions on a global scale. After 1850 practically the whole world was opened up to Norwegian shipping, and the competence that Norwegian shipowners and sailors had built up became much sought after. The liberalization paved the way for a massive expansion of Norway’s shipping interests. In June 1849 Queen Victoria signed the Act that repealed the protectionist Navigation Laws, which had limited the participation of foreign ships in British trade and transport. At this time Great Britain was the centre of global commerce, and now the country opened its trade to ships of all nations. For Norwegian shipowners, the prey suddenly got much, much bigger, and the combination of low costs and high efficiency was a formula that triumphed in the British market. From 1850 to 1860 the Norwegian tonnage cleared in British ports increased by 191 per cent, and only the United States had a larger absolute increase in the transport of British trade.46 Freed from the limitations of Sweden-Norway’s imports and exports, and no longer hampered by protectionist measures abroad, Norwegian shipping flourished. The liberalization of the international market was a necessary condition for the enormous expansion that took place in the second half of the 19th century. Figure 2.3 shows that the Norwegian fleet growth was characterized by strong fluctuations in the first decades of the 19th century, followed by a slowly upward-sloping trend from 1830 onwards.47 However, the expansion in the period 1830–1850 was uneven, characterized by two steps forward and one step back.48 From the middle of the century the development changed dramatically. In the period 1850–1875 the growth was both much stronger and more persistent than before. The average annual growth rates increased from 0.18 per cent 1800–1830, a period with a see-saw pattern of growth and decline, to 3.85 per cent from 1830 to 1850. In the subsequent 15 years the Norwegian fleet grew at an astonishing 5.75 per cent annually, before falling back to 0.44 per cent in the years up to the turn of the century. The latter stagnation, however, was mitigated by the transformation from sail to steam. In fact, when we take into account the higher productivity of the steamships, the fleet continued to increase, with only a handful of hiccups, until the losses in connection with the First World War.49 In terms of “compensated tonnage”—a measure of transport capacity that takes into account the superior efficiency of steam vessels—the average annual growth was 3.7 per cent from 1865 to 1900. This was a reduction compared to the previous 15 years, but still a relatively large increase and far higher than the growth in the economy in general. 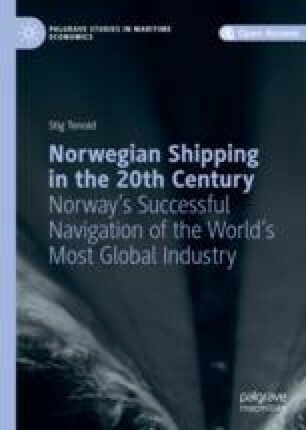 After the removal of political restrictions had “opened up” the international market in the middle of the 20th century, there was a self-sustaining element to the Norwegian shipping industry. Regardless of whether we call this “path dependence” or “tradition ,” the fact of the matter is that Norway’s fleet was very competitive in the international shipping market. It could offer reliable transport at a reasonable price. This was partly explained by the conditions at home: Norwegian shipping enterprises were very competitive in the quest for domestic capital and labour. In the 1850s, the first decade of this expansive period for Norwegian shipping, additions to the fleet were to a large extent built domestically. The industry had access to “the raw materials and the builders needed to manufacture first-class ships”—particularly on the South Coast. Moreover, “shipbuilding geniuses such as for instance Annanias Dekke in Bergen” competed among the leading shipbuilders internationally.50 The demand for ships outstripped the local supply and, from the 1860s onwards, a larger share of the new ships was imported.51 One reason for the increasing imports was the fact that the authorities during the 1850s twice reduced, and then finally removed, the “naturalization levy,” a tax on ships bought abroad.52 This tax had been to the benefit of shipbuilders, but to the detriment of shipowners.53 The other main reason for the growth was that shipowners in other countries—in particular the UK—modernized their fleets by investing in steam tonnage. Consequently, a large number of relatively inexpensive second-hand sailing ships were for sale in the international market in the last decades of the 19th century. The demographic development ensured an ample supply of seamen. A combination of local resources and institutions facilitated the investment in ships on which they could sail.62 The early dominance of Norwegian-built ships was related to the type of organization—partsrederiet [the part ownership ]—where local communities pooled their resources to invest in ships. The part ownerships were an ingenious way of raising investment capital for new shipping capacity, even though access to traditional equity and credit was limited. On the South Coast, “the forest, the wooden ship and the part ownership” were considered “the God-given foundation for shipping.”63 However, this organizational form also had its drawbacks, as it made long-term investment difficult. In the early expansionary phase, in the 1850s, when the majority of the vessels were built in Norway, most new ships were constructed as “a cooperation between the builder, the timber merchant, the captain and the supplier. Farmers who delivered wood from their forests, craftsmen and ships chandlers thus participated with a smaller or larger part based on their deliveries and resources. The out-of-pocket expenses thus became very limited.”64 Shipping was a potluck business, where the owners contributed, often in kind, with what they had. The legal regime made the use of ships as collateral impossible. Although it was possible to borrow money on the basis of individual parts, it was also common to use dwellings, farms or friends and family as guarantee. The part ownerships were “projects,” where the investment horizon was the lifetime of the vessel. Profits were paid out at regular intervals or as and when they occurred—sometimes after every individual voyage. When the ship was sold, scrapped or lost, any remaining funds were paid out to the part owners according to their share of the investment. The project then ended—the business was over. Investors reduced their risks by diversifying and participating in several vessels, and it was easy to reinvest the funds in new ship parts. A combination of tradition and agreements—within the boundaries of a very limited legal framework—served to regulate the part ownerships. According to Sjøloven av 1860 [the Maritime Act] the vessel could only be insured if all part owners agreed. If the ship was not fully insured—or not insured at all—it was possible for individual owners to insure their parts. In order to avoid costly foreign insurance arrangements, mutual associations were established along the coast. From a slow and late start in the second half of the 1830s, by the middle of the century around three-quarters of the merchant marine had been insured in mutual associations—“an astonishing breakthrough” for a type of organization that was new in a Norwegian setting.65 It has been claimed that the efficient and low-cost insurance arrangements helped the Norwegian competitiveness.66 The high market share remained well into the 1890s, when a larger share of the ships—in particular sailing vessels—began to sail without hull insurance. Shipping was hard work, and it was risky. In the last part of the 19th century, as the sailing ships got older, loss rates increased tremendously. Still, this dangerous, but profitable, activity lay the foundation for the Norwegian position as a major maritime nation. By the middle of the 19th century, shipping had become a crucial economic activity all along the coast in the southern part of Norway. Although the sector often had to share its key role—some places with forestry, other places with fishing or whaling—it was an integral part of the market economy, providing employment, investment opportunities and services. By the turn of the century, Norway had 10 ships for every factory. The second element is “Norwegian culture,” which covers the manner in which society was organized, including the norms and values that gave Norwegian shipowners a competitive advantage internationally. Specifically, in most coastal communities in southern Norway, work on and investments in ships was an important activity.73 As the legal infrastructure was limited, the concept of trust, regulated by and integrated in informal local networks, became important. The cultural aspect, and here we are mainly talking about the maritime element, was clearly linked to the geographical and historical foundations. The influence from the surroundings, and in particular the visibility of shipping, enticed young males to see a career at sea as the embodiment of the ultimate dream. Norway was the land of the Vikings. Vikings went to sea. The sea began just outside the window. However, the culture also changed across time, hence “when the sailing ship era ended, a distinctive culture died out.”74 The transition to steam changed the life of most seamen both at sea and in port, but it did not change the perception of Norway as a maritime nation and Norwegian men as a seafaring tribe. The mystery and attraction of the sea is a staple of seamen’s memoirs: “I had my heart set on going to sea […] my greatest delight was to roam the waterfront and watch and listen to the sailors at their work in the ships’ rigging, and their singing, hoisting and bending sails to the yards and spars, preparatory to the setting out for voyages to far places. Here was romance, here was life.”75 With a starting point such as this, it is perhaps not surprising that the boy in question ends up as a captain. For the 19th and the first part of the 20th century, shipping was the most important lifeline to large parts of the world. Exotic cultures did not have many inroads into Norwegian society at this time; the country had a modest military and colonial presence abroad, and mobility was slow and limited for most people.81 In the days before low-cost plane tickets, mass tourism and public broadcasting, information about distant places came primarily via seamen, missionaries, emigrants and a small number of merchants and adventurers. The written seamen’s memoirs were but a small part of the transmission of life at sea and abroad. More important were the gifts that the sailors brought home and the “taste of the sea” that they gave by means of stories, tall tales and songs. Shanties (work songs) and other seamen’s songs were important culture bearers, anchored in the coastal communities, where young boys heard about Pensacola and Pernambuc—not Paris or Berlin.82 Onboard the ships, the shanties had a function—they were used to coordinate the sailors’ work. Ashore, their call-and-response could create a sense of community, bringing the sea back to the shore and stirring the adventurousness of those at home. The transmission of seamen’s culture through stories and songs was informal, but the country’s sailors played a more formal role as cultural ambassadors as well. Several Norwegian museums built up their ethnographic collection on the basis of what sailors brought home from abroad; they were instructed by the museums about which pictures and artefacts that would be interesting.84 Foreign memorabilia—souvenirs, novelties, mementos and exotic objects—were common in the homes of sailors and their families. The sea was the path to the rest of the world; the seamen were the guides. The “maritime culture” clearly made its mark on Norway. But how did “Norwegian culture” influence the country’s foray into shipping? The small transparent communities encouraged the dispersed type of ownership that characterized the Norwegian partsrederier . In the absence of a clearly-defined legal framework, the strong social control and the threat of social exclusion created a quasi-institutional legality. The shortcomings of the public legal system were thus neutralized. In this respect, the experience is not very different from that seen within some fringe religious movements, such as for instance Quakers. There was an awful lot of trust and good faith involved in the manner in which shipping investments were organized and business was conducted. Joint investments and other interactions had the properties of a “repeated game”; you could not cheat your fellow shipowners, because you would have to look them in the eye when you met them in church or on the street. Moreover, you needed them to trust you with their resources in the future as well. Of course, not all business ventures followed this idealized model, but the “trust” aspect of Norwegian culture and society clearly enabled and encouraged capital formation on a scale that would otherwise have been unthinkable. When more modern types of incorporation, for instance limited liability companies, replaced the part ownership, the “old” mechanisms continued to play an important role. As we shall see, this cooperative spirit—between investors, but also between for instance shipowners, banks and insurance companies—continued to be relevant into the 20th century. The joint projects—sometimes with unlimited responsibility—were beneficial for all parties when the markets were going up and there was a need to pool resources to remain competitive, but they also meant that problems spread rapidly when the demand conditions deteriorated. Trust between partners and other business relations—both before and after the existence of a more formal legal framework—was a Norwegian “character trait” that facilitated the country’s shipping investment. Other results of this trust—for instance the low insurance premia in local associations—gave Norwegian owners a cost advantage that improved their competitiveness. So, the social control seen in the coastal communities, through its effect on investment and profits, undoubtedly helped build up Norway, the maritime nation. The egalitarian nature of Norwegian society may also have boosted the maritime presence. Throughout the 19th century Norway was a society characterized by the absence of nobility, and with class differences that in an international perspective can be considered relatively low. For sure, Norway was far from an egalitarian paradise where paupers and princes went hand in hand. However, the fact that there were relatively weak class distinctions affected the development of a maritime Norway positively. For instance, the willingness to accept investments from all parts of the population—without discrimination—enabled capital formation. This notion that everyone—“the clergyman, the doctor, the district recorder, and in particular sailors, merchants, craftsmen, even servant girls”—had invested in shipping, is a generalization that should be modified.89 Like investments in general, the majority of the funds came from the wealthiest. Although Olaf Ditlev-Simonsen claims that 90 per cent of the shareholders were small savers, his own company “signed up for a large part.”90 Still, there is little doubt about the fact that the shipping sector was a vehicle for social mobility. The sailing ships offered careers for hard-working boys; the best and the brightest could rise in the ranks until they were masters themselves. Experience and skills were acquired on-board; along the way, if funds were put aside, the sailor could become investor. Towards the end of his career, when the experienced captain signed off, he would use his knowledge and take over as corresponding owner for one or more ships. Naturally, not everyone managed to reach that far—but the possibility was there. When Ordinary seamen had signed on a couple of times, they became Able seamen, and could progress to Boatswains. Third mates could become Second mates and then First mates. And First mates could become Captains. The main task of the managing owners was not unlike that of the captains; to navigate profitably and safely in conditions that were unpredictable and difficult to influence. During the great expansion of Norwegian shipping after 1850, the managing owner had often in practice been little more than the partners’ book-keeper. Many—or most—of the short-term business decisions were made by a captain who was far away and difficult to instruct. As communication channels improved, commercial decisions about cargoes and trades could more easily be made at home. Former captains could combine their accumulated knowledge of ports and markets, with “ears on the ground” and information from other public and private sources, and then relay their instructions to the ships. Decision-making power moved from the sea to the home port. When the 19th century became the 20th, Norway was not a fully independent nation; the monarch and the foreign policy were shared with Sweden . However, during the 19th century a distinct and separate Norwegian identity had continued to develop; a national-romantic cultural awakening and increasing knowledge and incomes stirred the flame of independence. The differences between Norway and Sweden —and in particular their diverging economic and political interests—became more pronounced. There is no doubt that the Norwegian emergence as a major maritime nation was an important part of the picture that led to the dissolution of the union and Norway’s independence in 1905. At this time, consuls—the national representatives abroad—were a crucial element of the mercantile and maritime infrastructure. These consuls were appointed by the Swedes, who were in control of the dual kingdoms’ foreign policy. Naturally, they tended to have Swedish interests at heart. Norwegian politicians—led by the cunning Bergen shipowner Christian Michelsen, who was appointed Prime Minister in March 1905—consequently demanded separate Norwegian consuls. This controversy—followed by some clever political manoeuvring—led to the dissolution of the union and proper Norwegian independence in 1905. Other things remained the same, however. Around the turn of the century, wars continued to create periods of exceptional revenues, while freight rates were depressed and following a long-term declining trend in more peaceful periods. The Second Boer War (1899–1902) enabled “every craft to obtain constant work and at highly remunerative freights,” while The Russo-Japanese War (1904–1905) created “an extensive trade in all merchandise, contraband and legal, with both belligerents, and a corresponding demand for tonnage.”95 Both conflicts had a favourable effect on Norwegian shipping revenues. In 1912 and 1913 freight rates improved again, not as a result of war, but due to a business cycle boom. The return from tramp shipping “which for several years had been around 5 per cent of the capital” increased to 25 per cent by 1913.96 But the eternal problem with cycles is that after they have gone up, they are bound to go down. He was totally wrong.98 Over the next four years, Norwegian shipping companies would see their most profitable period ever, and Norwegian sailors one of their most petrifying. Grieg 1922, “The Flag” from Rundt Kap det gode Haab, author’s translation. See Table 2.1 for sources. There is a theoretical possibility that another country might have had a higher relative share of its investments in shipping (for instance if total investments were much lower than in Norway). However, based on what we know about the economic structure of the countries at the time, the claim that Norway had put the highest share of its investments in ships is undoubtedly true. Table 2.1: Statistics Norway (1902a), Tables I and K, 168–169. Based on vessels above 50 tons, 31 December 1900. Tonnage figures for Russia refer to 1895, and do not include ports on the Caspian Sea and the Pacific, while the tonnage figures for Italy refer to 1898. US tonnage figures refer to 30 June 1900. British American seaborne trade refers to Canada, and British Australian to Victoria and New South Wales. Tonnage per capita refers to estimated tonnage, where one steamship ton is equal to 3.6 sailing ship tons. For a more precise description of the data behind the shipping movements, which include vessels in ballast, see the original source, Table K.
Refers to the countries included in the sample in Table 2.1. In 1874 the British share of the world fleet had been more or less identical to this, but the share of world trade was higher. On the relationship between merchant marines and trade, see Ojala and Tenold (2017). A caveat: the volume of seaborne trade in itself does not determine the need for shipping capacity. In order to fully find a country’s actual “transport demand,” the distance that the cargoes are transported must be taken into account as well. Thus, the almost 14 million tons of Australian exports and imports—much of it going to or coming from Europe and the Americas—led to a higher demand for tonnage than the around 17 million tons of Italian seaborne trade—much of it transported in vessels pottering about in the Mediterranean or on short voyages to other European countries. The “world average” would be 7.4 tons of cargo per ship ton, based on the countries where we have data for both fleet and shipping. 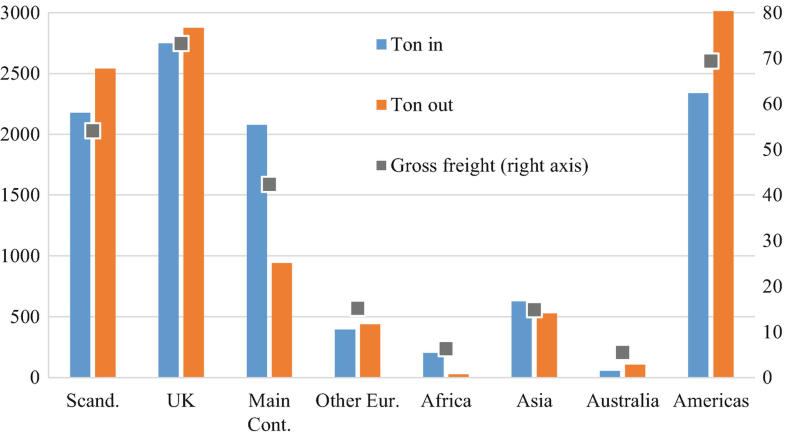 Six countries—in addition to Norway and the UK, Japan , Germany , Austria and Greece —were below the world average, and can be considered “theoretical net exporters of shipping services.” Of course, a lot of confounding factors imply that this calculation is imprecise. However, it can at least give us an indication of the countries that had large fleets relative to their trade, and vice versa. Statistics Norway (1902b, 54–55 and 25). New York Times, 08061894, 5. Of the 63 ships included in a survey of the fruit trade, 37 were Norwegian. See Brautaset and Tenold (2010). See Lie and Roll-Hansen (2001), Bjerkholt and Skoglund (2012, 22–27) and Kiær (1876–1892). Calculated on the basis of Statistics Norway (1902a, 70). Perhaps surprisingly, the share is more or less identical regardless of whether we include vessels arriving and leaving in ballast. See Fig. 2.1 for details. The figure differs from that in Table 2.1, where ballast movements were included. 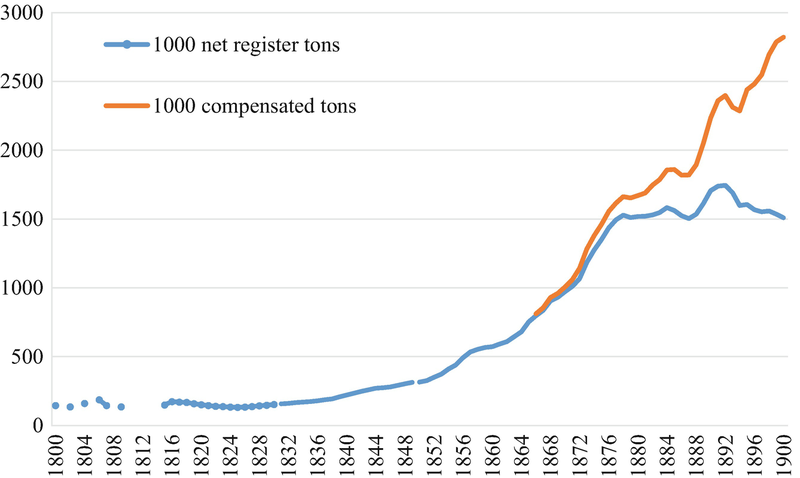 Figure 2.1: Data refer to total tonnage and are taken from Statistics Norway (1902a), Table 55, 73. The statistics are based on the tonnage of the ships cleared, rather than the weight of the cargo. While ships in ballast are reported separately, but included in these figures, the statistics are not adjusted to reflect ships that are not fully laden. There are some missing reports in the data, see Statistics Norway (1902b), Tables 18–20, 54–81. Given that vessels are registered both on their ingoing and outgoing voyage, their transported volumes are counted twice, but this has a minimal impact on relative shares. Scandinavia: Norway, Sweden and Denmark (including Iceland and the Faroe Islands). UK: Great Britain and Ireland. Main Continental: Germany , the Netherlands , Belgium , France , Portugal and Spain . Other Europe: Russia / Finland ; Italy , Malta and Austria-Hungary; and Turkey, Rumania and Greece . The Americas: North America; West Indies, Mexico and Central America; South America. Figure 2.2: Data refer to ingoing and outgoing laden tonnage, excluding vessels in ballast, and are taken from Statistics Norway (1902a), Table 55, 73. There are some missing reports in the data, see Statistics Norway (1902b), Tables 18–20, 54–81. Given that vessels and revenues are registered both for the ingoing and outgoing voyages, transported volumes and gross freight earnings are double-counted. The category “adjusted gross freight earnings” includes vessels operating on time charters, and are not included in the data presented in Statistics Norway (1902a), Table 55, 73. Groups are the same as in Fig. 2.1. Almost 40 per cent of the earnings in the Americas were reported after coal and port costs had been deducted, compared with less than 10 per cent of the British earnings. In the trades on Japan and China, practically all of the earnings—more than 99 per cent—have been categorized as timecharter revenues in the statistics. Table 2.2: Information on number and gross register tonnage (grt) from Statistics Norway, 1901, Table 35, 51. Based on vessels listed as part of the foreign-going fleet , 31 December 1900. Information on volumes and revenues from Statistics Norway (1902a), Table 55, 73. To avoid double counting, volumes and gross freight earnings are estimated as the average of inward and outward volumes and values. Higher variable costs would offset some of the steamship profits. The differences between estimates per ship and per ton are accounted for by the fact that the steamships in this part of the fleet were on average 85 per cent larger than the sailing ships: 670 versus 361 tons. This figure is likely to be underreported. Information from smaller ports was less likely to get to London and the compilers of the Lloyd’s List in time. Moreover, the publication did not report extensively about smaller ports on the European continent; see the note to Table 2.3. The economic historian Jan Tore Klovland, who has meticulously collected information on more than 200,000 voyages from the period 1835–1920, has more than 2400 different ports listed in his material. It is likely that the majority of these were visited by Norwegian ships. Information on Nash Creek from the Provincial Archives of New Brunswick. And it was a dangerous trip. Captain Hansen’s barque Pons Aelli, the only Norwegian ship registered between these two ports in 1902, had to be abandoned in the middle of the ocean. Aalborg (Denmark ) and Zarate (Argentina) were quite common destinations. However, the data set contains only one observation each for Wuhu (China) and Ha Ha Bay (Newfoundland). Skre, Dagfinn (2014, 34–44). This is of course the opposite of nominative determinism; the country got its name because it represented the way to the north. At 25,000 kilometres (km), Norway’s coastline is the seventh longest in the world and longer than the coastlines of for instance the United States , New Zealand and China. According to data from CIA’s World Factbook it is almost twice as long as that of Greece , which is second in Europe (not counting Russia and Greenland). Data from the Norwegian Mapping Authority suggest that the length of the coastline increases to more than 100,000 km when fjords, bays and islands are included; Statistics Norway (2015, 6). Figenbaum et al. (2009, 7). A læst [last] was an old measure of the size of ships, in Norway usually measured in terms of barrels of grain (12) or coal (18). However, the “commercelæst” was defined in the statistics as a weight measure (equal to 5200 pounds) before 1846, and as a volume measure (equal to 165 cubic feet) after 1846; see Statistics Norway (1948, 238). With the transfer to the Moorsom measuring system in 1876, a common means of translation was to set one last equal to around 2.1 net register tons. Almost half of the Norwegian sailings to the Baltic in the period 1575–1654, as registered in the Sound tolls, were by Bergen vessels. Around 1730 the city’s monopoly in the trade on Greenland and Iceland was transferred to Copenhagen, reducing the need for tonnage. Based on Statistics Norway (1902b), Table 1, 3–9. See also Schreiner (1963, 14–19), for a discussion of the development in the period up until 1914. The Norwegian Joint Committee on International Social Policy (1959, 20). Again, the exception would be Greece , where the maritime legacy also has a dominant position, in particular in Piraeus and on the islands. For a good introduction to the regional and family dimensions of Greek shipping, see Harlaftis and Theotokas (2004). In the early 1970s, the book Norske sjømannslegater og stiftelser [Norwegian seamen’s endowments and foundations] was around 250 pages long and contained information on more than 400 individual endowments by shipowners, consuls, captains and their wives. Fittingly, the book was published by a fund established by the Norwegian Shipowner’s Association to honour the memory of Norwegian sailors during the First World War; see Norges Rederforbunds Sjømannsfond av 1918 (1973). Denmark-Norway re-entered The Great Northern War in 1709. In the period 1710–1713, Bergen lost 55 ships, almost half of the pre-war fleet, to privateers (who were basically government-sponsored pirates); see Dyrvik (1979, 107). In order to avoid privateers, ships could take to the sea when the sailing conditions were bad. This of course increased the probability of wrecking. When Denmark-Norway was involved in wars, Norwegian ships were sailing between a rock and a hard place. In the 19th century, another bulky cargo, ice, was added, and in the peak years around 1900 more than a million tons of ice was exported annually. Technological advances onshore—improved refrigeration and production of plant ice—led to a market meltdown, and the Norwegian ice exports had more or less dried up by the outbreak of the First World War. Quote from merchant’s testimonial to a 1786 Board of Trade inquiry; Johansen (1992, 487). Dyrvik (1979, 177). According to a survey of the pre-war fleet in Den Norske Rigstidende, 1 February 1815, 1 the three main shipbuilding areas were Arendal (174 ships), Bergen (170 ships) and Øster-Riisøer (Risør, 115 ships). See for instance Kiær (1893, 333), or more detailed discussions in Thue (1980, 150–151), Tveite (1965) or Schreiner (1952). See for instance Berit Eide Johnsen’s fascinating book on the cultural exchange that this entailed; Johnsen (1993). Eitrheim et al. (2016, 84–85). The Kalmar Union between Denmark , Sweden and Norway was formed at the end of the 14th century. Sweden finally withdrew at the start of the 16th century, and Denmark gradually strengthened its grip on its Norwegian partner. On the effects of the Navigation Acts in Scandinavia, see Ojala and Räihä (2017). A provisionary decree that abolished the restrictions was introduced in May 1825 and confirmed by a law in August 1827. Norway, Parliament, Odelsthinget, 13071839, 679 and 685. The politicians’ powers of prediction were no better in the 19th century than they are today. Less than 18 months after this discussion, the first Norwegian vessel rounded Cape Horn. Among the cargoes that the brig Preciosa carried was aquavit, a traditional Norwegian potato spirit. Even today, aquavit is transported on ships crossing the equator, where humidity, continuous movement and temperature changes affect the maturation and the final taste. Preciosa became so famous that the Norwegian poet Henrik Wergeland wrote a shanty specifically about the ship. See Nordlyset, 05071844, 3 and Blom (1977, 177–180). Figure 2.3: For a good discussion of the problems of estimating the size of the Norwegian fleet in the 19th century, see Brautaset (2002, 118–128). Due to the considerations presented there, the data used here should be seen as a minimum, and are based on the following sources 1800–1809 from Dyrvik (1979, 177), 1815–1830 converted from the data in Commerselæster by the factor 2.1 from Kristiansen 1925; 1830–1865 based on Brautaset (2002, 258). Both of these sources have adjusted the official statistics, but refer to the full fleet, rather than the ships trading abroad; see also Broch (1876, 81). Data from the period after 1865 are taken from Statistics Norway (1948), Table 126, 241–242; the data on “compensated tonnage” imply that steamships have been multiplied by a factor of 3.6 to account for their higher efficiency. 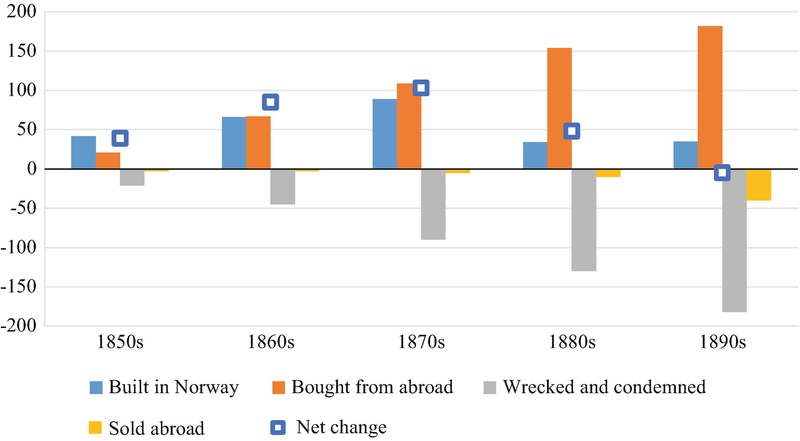 The data in Brautaset (2002, 261) suggest that the annual export of shipping services declined in 30 per cent of the years in the period 1830–1850, compared with 13.3 per cent in the period 1850–1865. The only years with decline after 1850 were 1857 and 1858, and are thus closely associated with what Hughes 1956, 194 refers to as “the first world-wide commercial crisis in the history of modern capitalism.” For the Norwegian dimension of this crisis, see Eitrheim et al. (2016, 156–164). Estimates are average annual compound gross rates based on net registered tonnage; for information on the data, see Fig. 2.3. Though, at this time, there was a much larger overlap between these groups than today. Figure 2.4: Statistics Norway (1968), Table 176, 364–365. Net increase and decrease based on individual columns, which differ from the aggregate figures given in the original source. Supplemented by information from Statistics Norway 1949, Table 129. The original source points out that the figures for the early period are “incomplete, due especially to difficulties in securing exact data as to the great number of vessels not registered.” The “unregistered” vessels are sailing ships smaller than 50 net register tons and steam and motor vessels smaller than 25 net register tons. This poses larger problems for the data on the number of ships, than for the tonnage figures, as the majority of the unregistered ships were small vessels. Based on the number of ships, production peaked in the second half of the 1860s. However, due to increasing average size, in tonnage terms the first half of the 1870s saw the largest production; see Fig. 2.4 for information on the statistics. Hodne (1981, 27). Based on slightly different data and methods from what we used above, Hodne calculates the annual growth rate of the fleet to be 6.8 per cent for the period 1850–1875. Calculated on the basis of ton-miles data in Brautaset (2002), 259. For a good overview of the discussion of Norway’s industrial breakthrough, see Basberg (2006, 4–7). O’Rourke and Williamson (1999, 122). The original text says “compels.” US Senate, 1922, To amend Merchant marine act of 1920: Joint hearings before the Committee on Commerce, Washington: Government Printing Office. Bergh et al. (1983, 113). An early 20th century presentation of tramp shipping quoted in Harlaftis and Theotokas (2004, 219). In an international perspective, the largest Norwegian cities at the start of the 20th century, Kristiania and Bergen, clearly had small-city features; among the bourgeoise—the merchants and shipowners—everybody knew everybody. In 1900, the population of Inner London was three times as large as that of Norway. Rasmussen (1952, 14); see also 36–40. Adolescents with romantic views of seamanship and the call of the sea are found, for instance, in Stamsø (1929), or the interview in Tranøy (1941, 41–43). Kiær (1893, 363). Kiær’s reasoning, “How can these young Viking lads but long for the time when they, too, are permitted to cross the sea into the wide, wide world?”, is almost poetic in its prose. The fact that the article was published in The Journal of Political Economy , a periodical that both then and now ranks among the most important in economics, illustrates the drastic transformation of economics as a branch of science. Today, authors in the journal argue by equation, not by interpretation; by positivism, not by prose. See for instance Tønnessen (1996), as an example of someone leaving for the sea out of necessity. Pettersen and Brundtland (2002, 72). This was an era of great contrasts. Many people never left their home town or village, those who did often went far—to the other side of the world. “Pernambuc’” refers to Pernambuco, in the north-eastern part of Brazil , the 18th most visited destination in the Lloyd’s List data set with almost 1 per cent of the port calls. The contraction makes the word rhyme with the Norwegian sukk [sigh], which the sailor emits when he thinks of Norway. For the full lyrics to “Sing Sally Oh”, a modern version based on Wergeland’s poem about the Preciosa, see Brochman (1937, 28–32). Austbø (2012). Missionaries made up the other significant group of collectors. Klausen (1999, 32–33) also emphasizes the strong Norwegian welfare state and the strong presence of the periphery in the political system, but these two features are not relevant in a 19th century setting. Pettersen (1980, 208 and 211). Due (1909), quoted in Sandvik (2018, 84). Ditlev-Simonsen (1945). At the time of his death, the “seaboy’s” group of companies owned 24 ships, amounting to 365,000 dead weight tons, slightly less than 3 per cent of the Norwegian fleet. Interestingly, his son, Halfdan—one of three sons that managed a shipping company—called his own autobiography, published 10 years after his father’s, “A shipowner looks back.” Here, he points out that “The landlubber-shipowners are in earnest entering Norwegian shipping with the generation to which I belong ”; Ditlev-Simonsen (1954, 14). Angier (1920, 101 and 115). This was not the most faulty prediction that Gunnar Knudsen made that year. During the debate on the King’s speech in February 1914, he pointed out that “At present, the political sky, globally, is in fact without clouds to an extent that has not been the case for many years.” Norway, Parliament, Stortingsforhandlingene 1914, 17 February, 35.